When developing a custom WordPress theme for a client we came across an annoying quirk in the WordPress editor user interface. I had added a custom post type to their theme to allow the client to create a database of service providers. 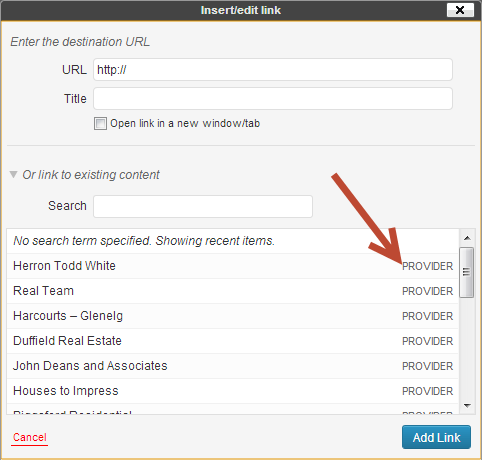 However, once their database was populated, we discovered that the “link to existing content” list in the “Insert/edit link” popup from the editor window was cluttered with all these “provider” entries which made it difficult to locate posts and pages that the client wanted to link to in their posts. UPDATE: This filter has now been included in WordPress v3.7 – this hack is no longer required to make the filter work! You can skip this bit and go directly to the part below about implementing the filter. After some extensive searching online, I found that there was no existing way to hook into the functions which generated this list – it would require hacking the core WordPress files to make these changes. // Check if any posts were found. Warning! only make modifications to your core WordPress files if you know what you are doing! Otherwise you would be wise to wait until v3.6 or so when it is hoped this patch will be part of the core release. To take advantage of these new hooks is quite straight forward. The first hook wp_link_query_args allows you to modify the parameters sent to the WP_Query object so you can customise the query itself. The second hook wp_link_query allows you to modify the resulting array. This $query array is sent to our new hook, so we can alter the values of the array to get the query to return what we want. $query['post_type'] is an array of post type names, which in our case is ('post', 'page', 'attachment', 'provider'). We simply want to remove provider from this list so the query doesn’t return posts of this type. Basically, I declared a new empty array $pt_new, then looped through all post types found by the get_post_types function, adding each to my new array but skipping the ‘provider’ type. Doing it this way makes it easy to extend the functionality in the future to skip other custom post types too. Thanks so much for taking the time to post this, it’s made my client’s life a LOT easier. Obviously I’m hoping this gets released with 3.6 but I think it’s “reasonably” acceptable to modify the core if we’re just adding a valid hook. Just need to keep it in mind during the upgrade.